Integrating strategies for life. Yoga with Melissa : Why Practice? Reflecting on why I practice yoga: What is it that draws me to it so much? How it makes my body feel (I'm the strongest, most flexible, and more knowledgeable about my body that I've ever been in my life. ), I think was my initial reason. But, now almost 6 years later, I think it's the acceptance, grace and awareness that it's created in me. I fail continually -- on and off the mat but what I keep going back to is not the amazing physical benefits but that there is something beyond myself- that everyone is same. We all have the same doubts, fears, struggles, odd family members and life road bumps. Hardships do not discriminate. However, there is the Divine (God) in everyone- and that if I don't see it in them and act as though I do, then, I am not seeing God at all. 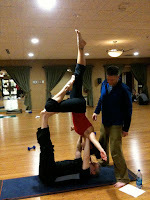 John Friend (founder of Anusara Yoga) asks in his workshops, "what offering we could make with our practice?" Grace when a pose is not aligned or "perfected"
Forgiveness- letting go of my critical nature- the internal chatter that says I'm not... good enough, thin enough, strong enough, that I'm not authentic or real, or that I'm too judgmental of others or myself.... (Fill in the blank here; I've thought it all). Acceptance in what I can do in the moment.